A new ban on the sales of single-serving plastic water bottles has taken effect in Concord. An empty water bottle sculpture in Burlington VT. The University of Vermont is preparing to ban bottled water sales, as has the town of Concord. The new law was adopted after a three-year campaign by local activists. 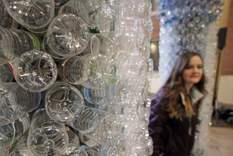 They pushed a return to tap water, saying banning the bottles will cut down on plastic waste and reduce the use of the fossil fuels used to make the bottles.